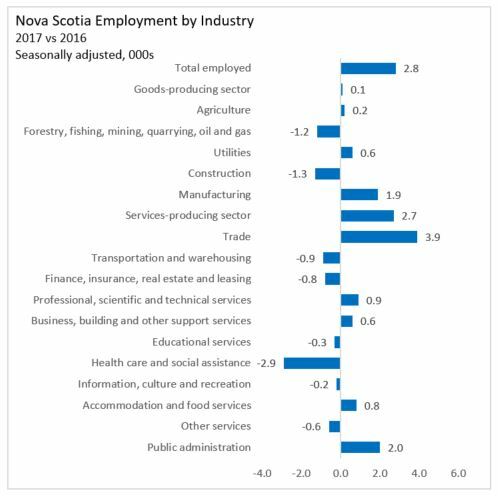 Nova Scotia's seasonally adjusted employment increased by 5,900 to 448,900 in December 2017. This is the first statistically significant increase since March and the fourth consecutive month of employment gain. Compared to November, Nova Scotia’s labour force increased by 2,300 to 494,500 in November. With labour supply growing at a slower pace than labour demand, the net result was a 0.8 percentage point drop in the seasonally adjusted unemployment rate to 8.0 per cent in December. With labour supply increasing combined with a slight increase in the working age population (+400), the result was an increase in the participation rate by 0.3 percentage points to 62.2 per cent in December. The growth in employment pushed the employment rate up 0.7 percentage points to 57.2 per cent. In December, the increase in employment was distributed across both full-time (+3,400) and part-time jobs (2,500). This can include the net impacts of changing hours of work within the same position. Comparing the preliminary annual estimates for 2017 to the annual estimates of 2016, there was an increase of 2,800 (0.6 per cent) in the average employment level. Average full time employment was up 400 while there were 2,400 more part-time jobs. The labour force was up 3,500 for 2017. With labour supply increasing at a faster pace, the net result was an increase in the average unemployment rate of 0.1 percentage point to 8.4 per cent. The labour force participation rate increased by 0.1 percentage point to 61.8 per cent. The employment rate increased slightly to 56.7 per cent. 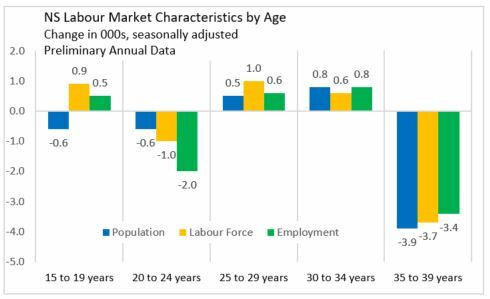 Review of labour force survey results by age cohort reveals the effects of changing demography on the labour market. 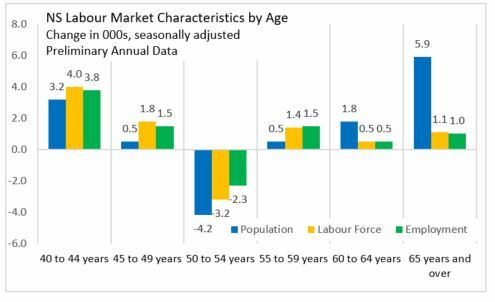 As the population ages, there is downward pressure on labour force and employment for younger groups and rising labour force and employment for older cohorts. In 2017, the population aged 15-24 declined compared with levels reported in 2016. However, the labour force was little changed and a decline in employment (concentrated among those aged 20-24) contributed to a rise in the annual unemployment rate among youth from 14.9 per cent to 16.8 per cent. Core aged (25-54) workers reported an overall population decline, but higher employment and labour force in 2017. 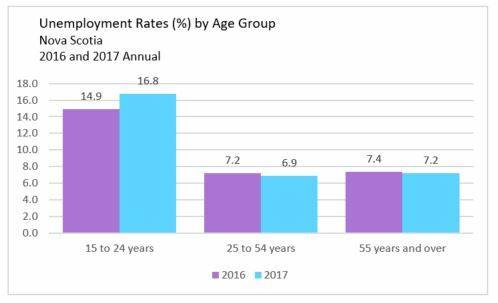 As employment growth outpaced labour force growth, the unemployment rate among core aged workers declined from 7.2 per cent in 2016 to 6.9 per cent in 2017. There were notable declines in unemployment rates for those aged 35-39 and 50-54 as the labour force (and population) fell faster than employment. Unemployment rates also fell for those aged 30-34 and 40-44 as employment growth was faster than labour force. 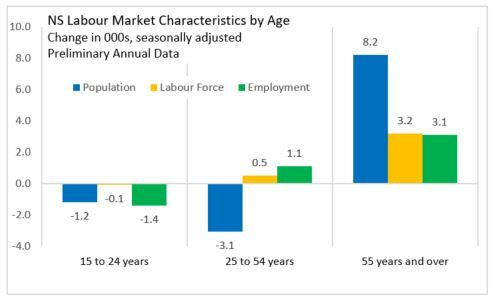 For those aged 25-29 and 45-49, rising labour force outstripped employment (and population) growth leading to a rise in the unemployment rates for these cohorts. Older workers (55+) report the largest population increases as the baby boom continues to age into this cohort. 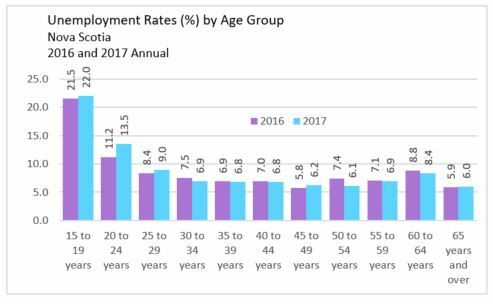 In 2017, the unemployment rate among older workers edged down to 7.2 per cent as employment growth just outpaced labour force growth, but both were notably slower than population increases for this cohort. While labour force and employment growth outpaced population growth for those aged 55-59, older workers had much slower growth in labour force and employment than population. This puts downward pressure on the size of the labour force and employment in Nova Scotia. Annual employment for 2017 in the public sector was up 2,000 (1.8 per cent), while private sector employment was up by 300 (0.1 per cent). Self employment for 2017 was up by 500 (0.9 per cent). Comparing annual estimates for 2017 to annual estimates of 2016, employment in goods-producing sectors increased by 100 jobs. Employment gains in agriculture, utilities and manufacturing were enough to offset a loss in construction, and forestry/fishing/mining/gas. There was a net gain of 2,700 jobs in service-producing sectors. Strong employment gains in wholesale/retail trade, professional services, and public administration were enough to offset the job losses in financial services, educational services, health care, information and cultural industries, and transportation and warehousing. 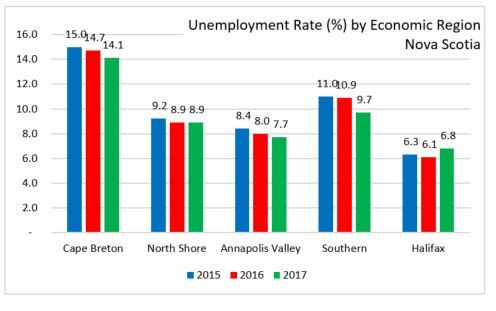 The annual 2017 estimates compared to annual estimates for 2016, two regions (South Shore, and the Annapolis Valley) reported employment growth that outpaced labour force growth, resulting in lower average unemployment rates. The Cape Breton region had falling labour supply with a drop in employment, pushing down their unemployment rate. The Norther Region had similar growth rates for both labour demand and supply resulting in no change to the unemployment rate at 8.9 per cent. The Halifax economic region was the only region to see its unemployment rate climb. This was due to falling employment combined with a slight increase in labour supply. The Cape Breton region reported 300 job losses in average employment levels for 2017 over 2016. The labour force decreased by 900 (-1.6 per cent) for the same period. With a slight decline in labour demand along with a larger drop in labour supply, the result was a 0.6 percentage point decrease in the unemployment rate to 14.1 per cent. For the North Shore region, employment increased 600 (0.9 per cent) for 2017 over 2016. Labour supply increased by 700 (0.9 per cent) for the same period. The relatively same growth rates for employment and labour supply resulted in no change to the annual unemployment of 8.9 per cent. The Annapolis Valley reported an increase in employment of 3,700 (6.7 per cent) and an increase in the labour force of 3,800 for 2017 over 2016. The net result was decrease of 0.3 percentage points in the average unemployment rate to 7.7 per cent. The Southern region saw a slight increase of 400 (0.8 per cent) in employment along with a small drop of 500 in the labour force for 2017 over 2016. With employment rising and labour force falling, the unemployment rate was down 1.2 percentage points to 9.7 per cent. 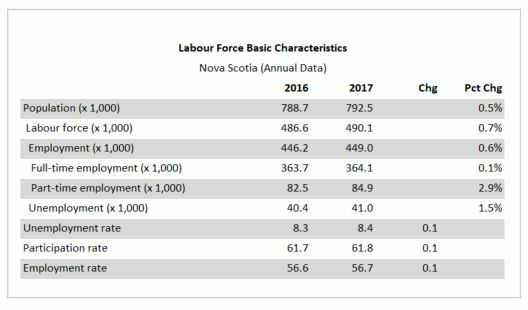 Comparing annual estimates of 2017 to annual estimates 2016, Halifax (HRM) experienced a decrease in employment of 1,500 (-0.7 per cent) along with a slight increase in the labour supply (300). These adjustments resulted in 0.7 percentage point rise in the unemployment rate to 6.8 per cent. 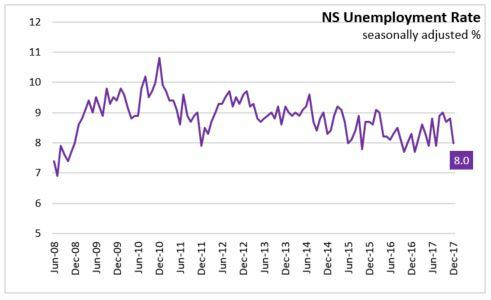 The Nova Scotia unemployment rate was 8.0 per cent in December 2017. In December of last year, the Nova Scotia unemployment rate was 8.3 per cent. 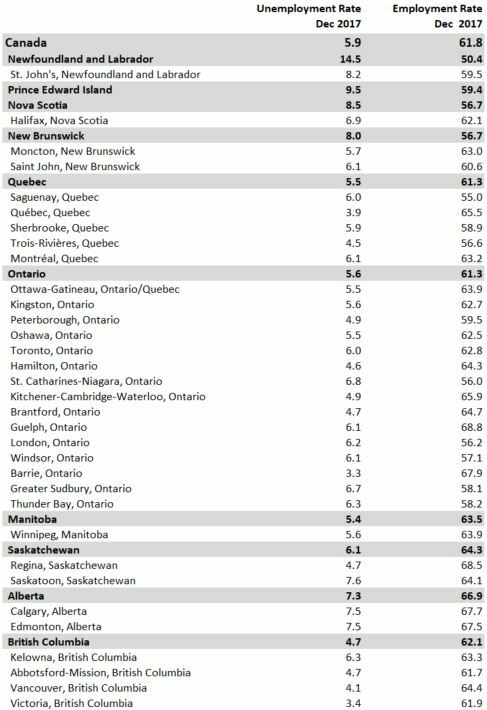 All provinces reported lower unemployment rates compared to the same month a year ago, with Quebec and Alberta showing the steepest decline (both 1.6 percentage points). 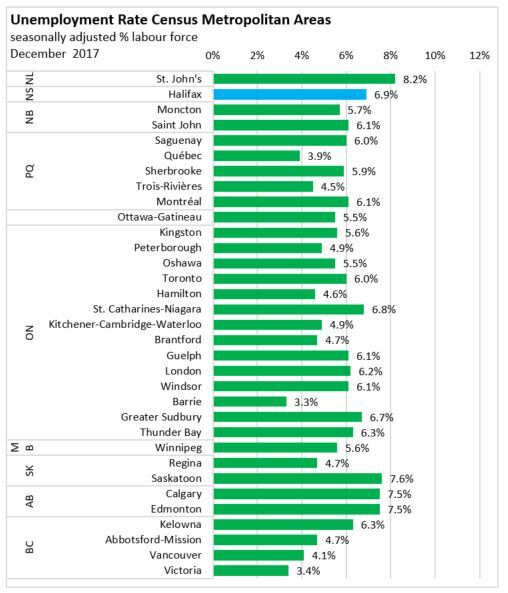 The lowest unemployment rate among the provinces in December 2017 was in BC at 4.6 per cent while the highest was in Newfoundland and Labrador at 14.7 per cent. Employment increased 1.9 per cent in Canada comparing 2017 with 2016. 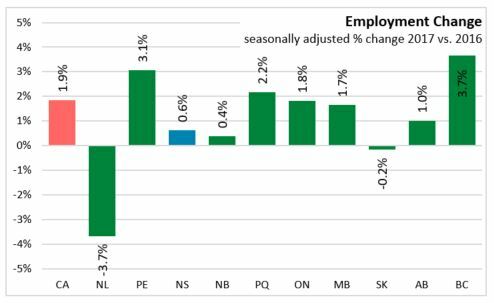 Employment grew on an annual basis in eight provinces with the largest gains in British Columbia (+3.7%), Prince Edward Island (+3.1%), and Quebec (+2.2%). 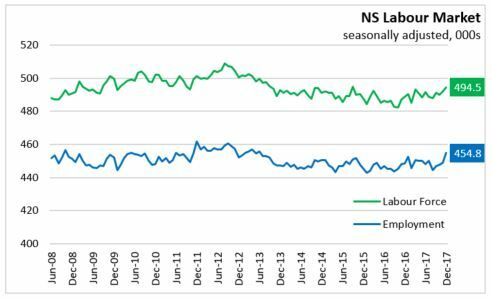 Employment in Newfoundland and Labrador (-3.7%) declined in 2017 according to preliminary annual estimates. 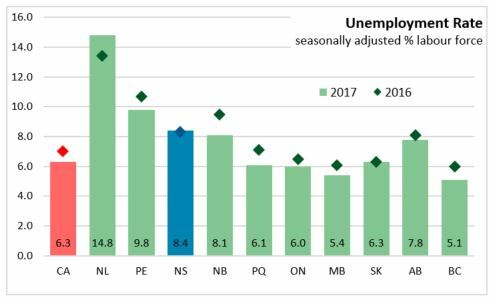 Annual unemployment rates declined in 7 provinces in 2017 compared to 2016. 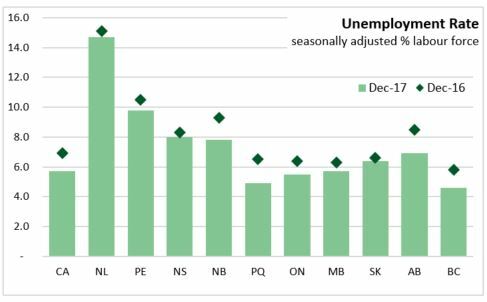 The largest drop in the unemployment rate was in New Brunswick, which showed a 1.4 percentage point drop in the rate to 8.1 per cent in 2017. Nova Scotia's unemployment rate climbed 0.1 percentage point to 8.4 per cent in 2017. 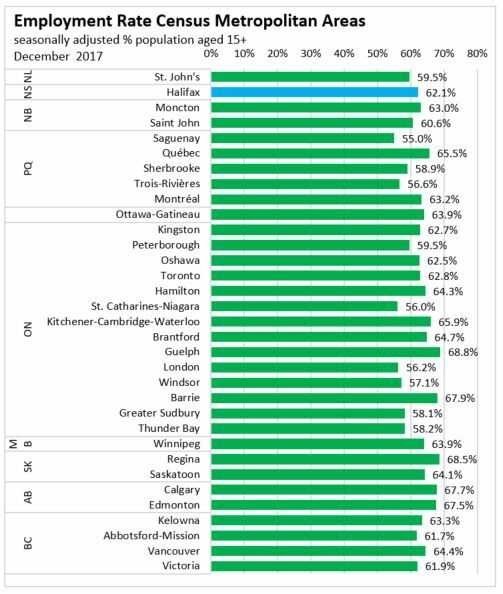 The seasonally adjusted employment rate for the Halifax Census Metropolitan Area was 62.1 per cent, up from 61.8 per cent last month. 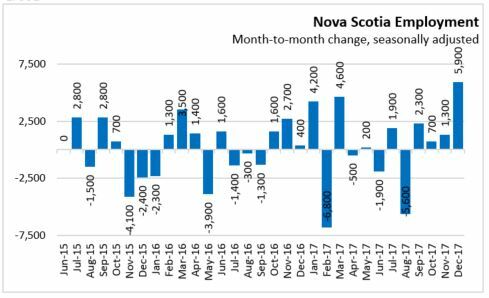 The three month average employment ending in November for the Halifax CMA was up 0.3 per cent compared to the three month period ending in December. 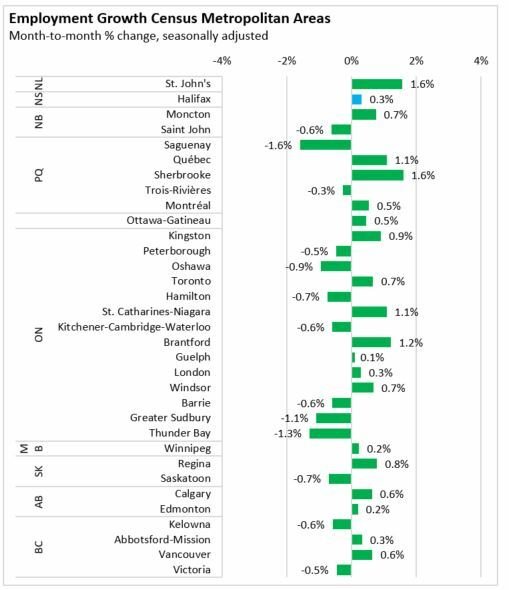 The largest gain among CMAs was in St John's and Sherbrooke, where employment rose 1.6 per cent. Note: Seasonally adjusted, 3 month average.